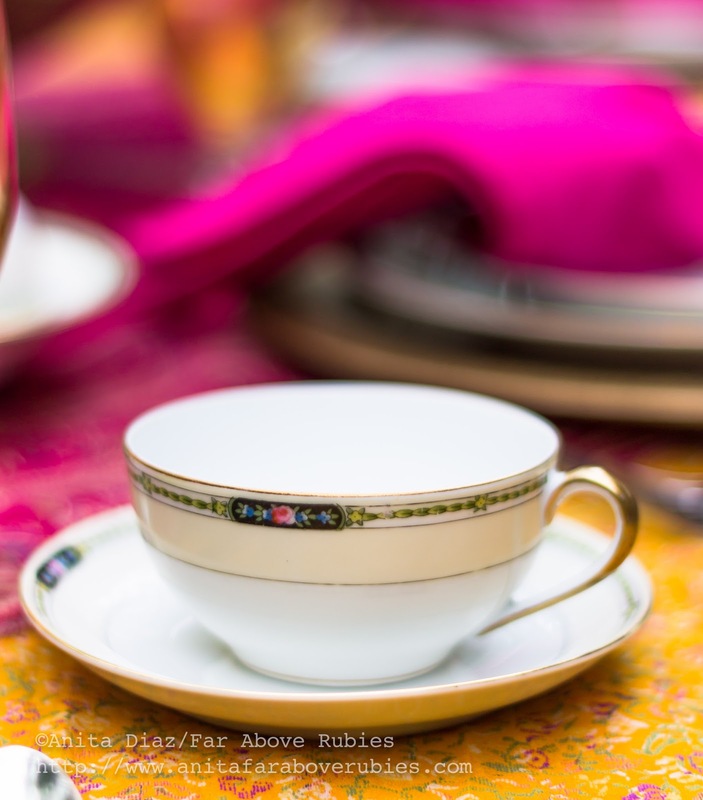 I set two tables last week for a ladies' tea, but because I also entertained, I did not get any photos. 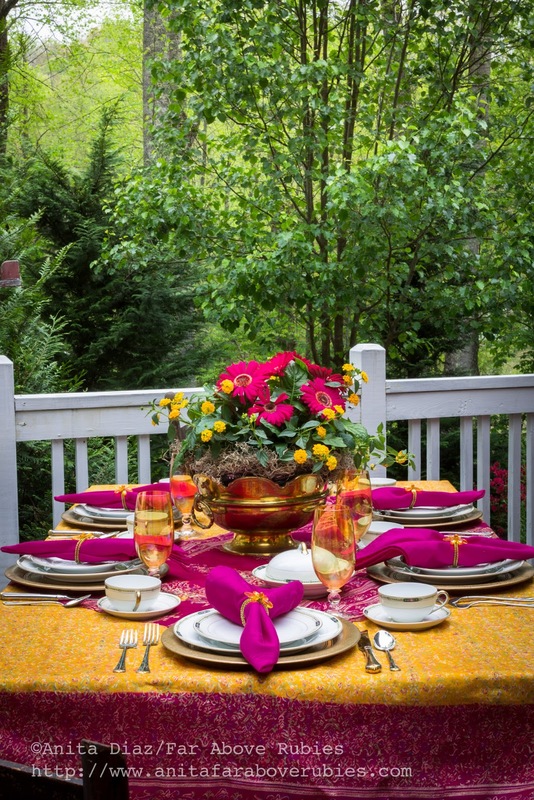 So...I decided to set up luncheon tables at home with both settings out on the porch. The Noritake Chandova that my mother inherited, has quickly become my favorite pattern. From 1921, it still has a modern look that I really think is timeless. 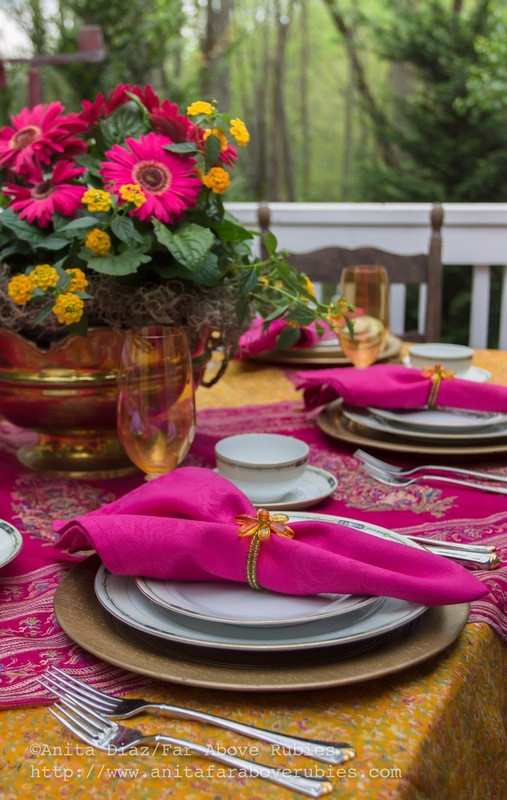 Iridescent glassware from Pier 1 Imports, years ago, is not a *match* per say, but ties the pinks, golds, and corals together without being predictable. 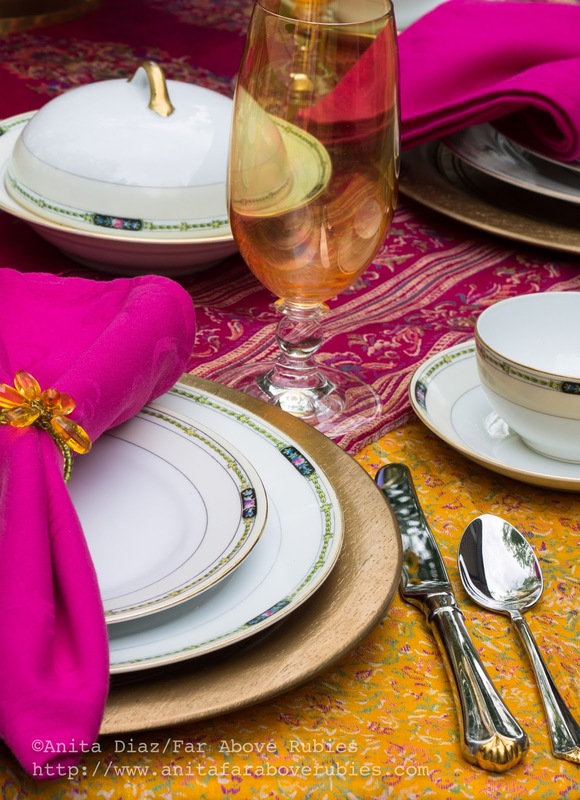 I paired the Chandova with Oneida Golden Juilliard flatware I purchased in the 1990s. I think the little touch of gold on the handles is just the right amount of gold. The wood chargers were purchased from ebay several years ago. I first stained them dark, then painted them gold last year. 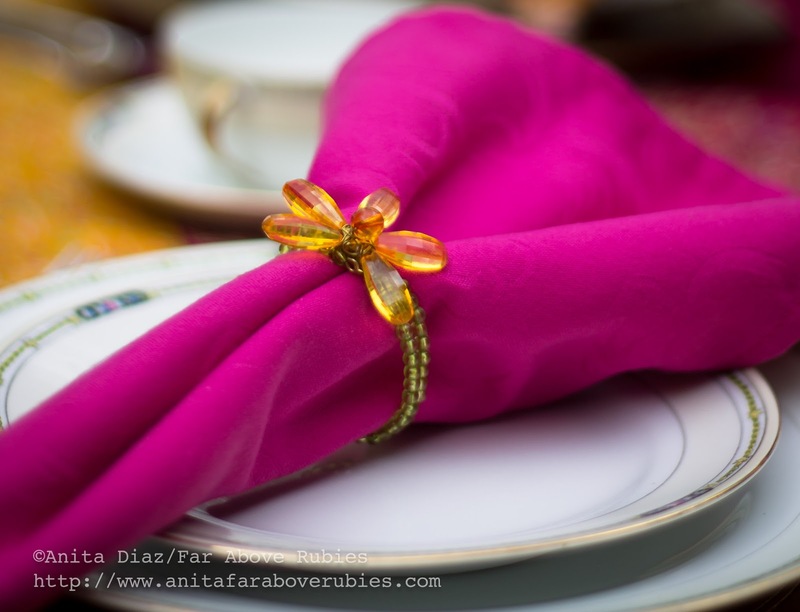 To keep things fresh and modern, I used a hot pink damask napkin and accessorized it with the April Cornell napkin rings. I love the green and gold in these, and they add a light and fun touch. 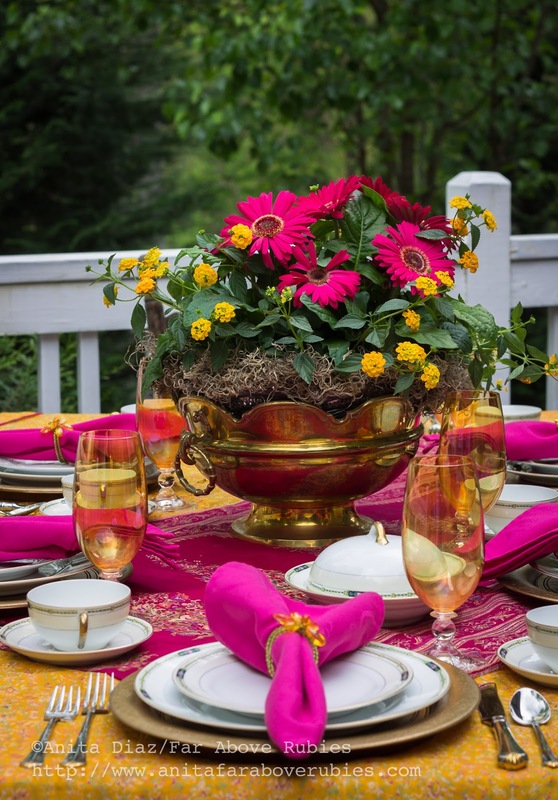 For a centerpiece, I borrowed my mother's inherited brass and crystal punch bowl from India. 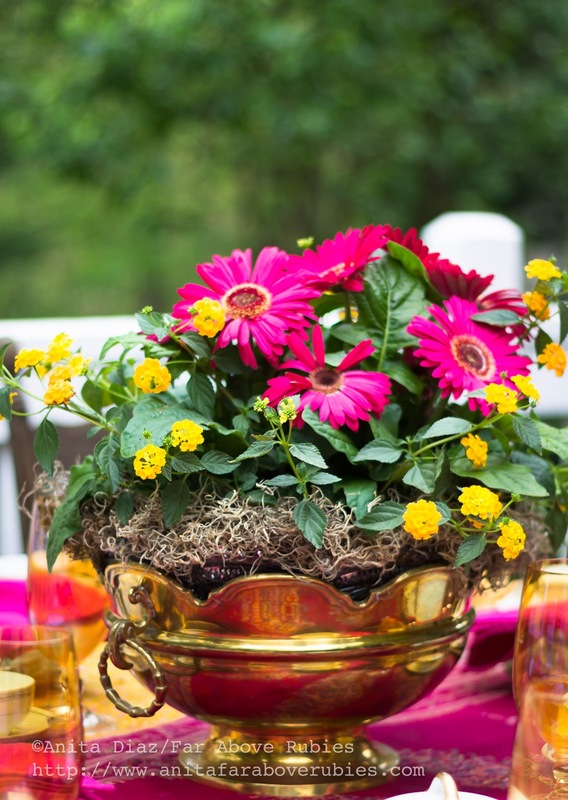 I simply added a pot of gerbera daisies and filled in with yellow Lantana. 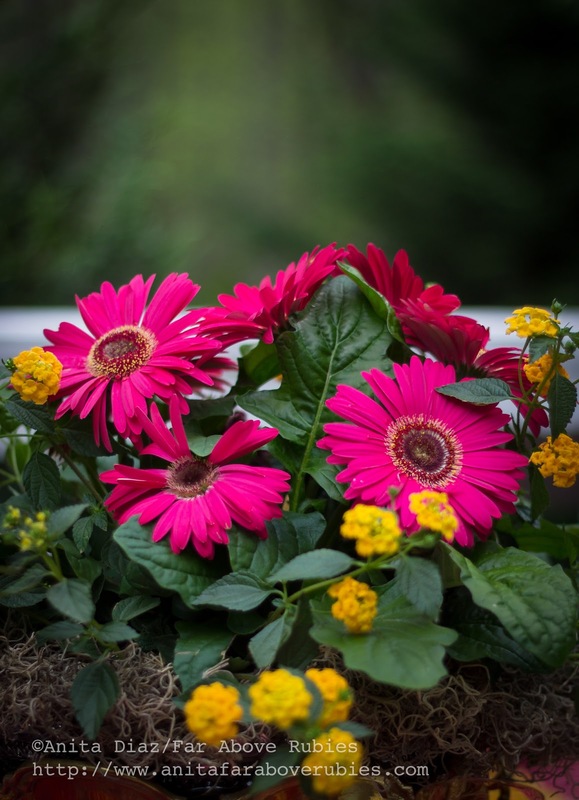 These can be planted in a flower bed later. 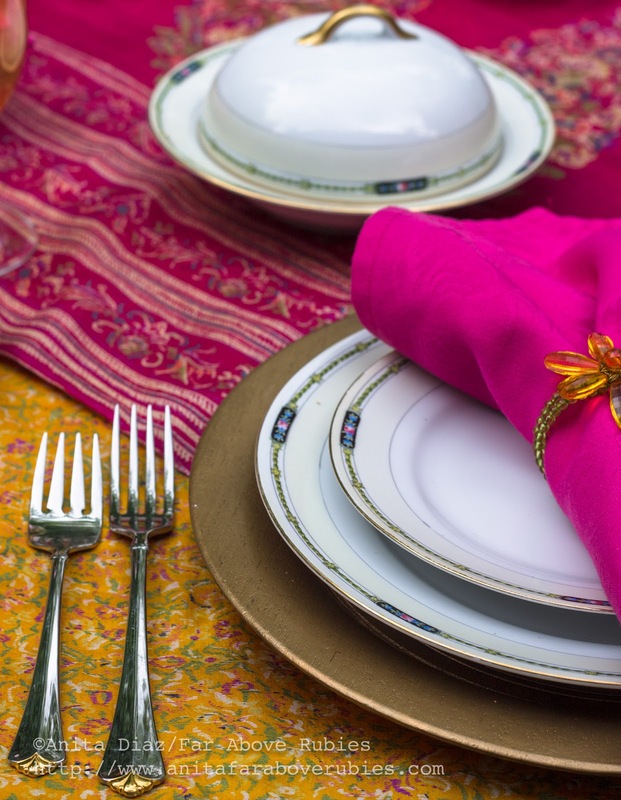 I chose a vintage Indian silk sari, in several square pieces, to cover the table, which was actually my color inspiration. 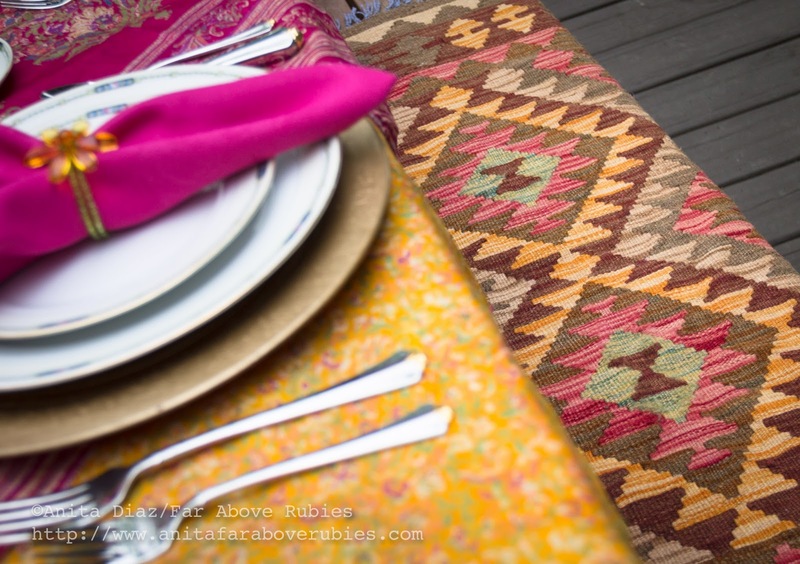 An Afghan kilim makes the hard bench a little softer and continues the color palette. 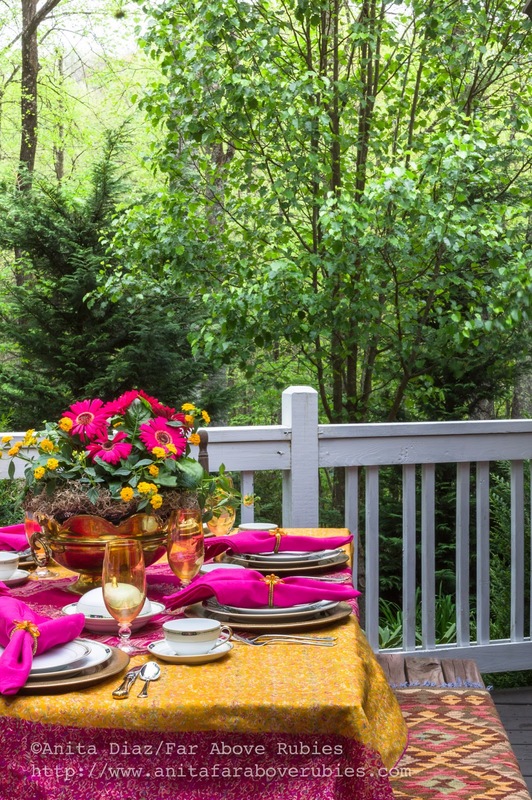 Of course the outdoor setting provides the perfect backdrop and would make any table feel special. But this particular setting really speaks to me, and my mom has let me *borrow* this set of china for a while. It is so beautiful!! I pinned it. 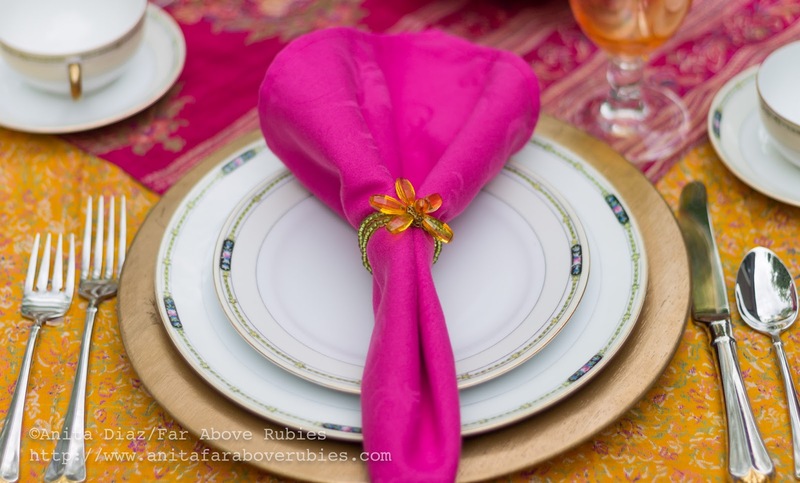 In fact I created a new board called Table Settings, just to pin this, because it inspired me so! 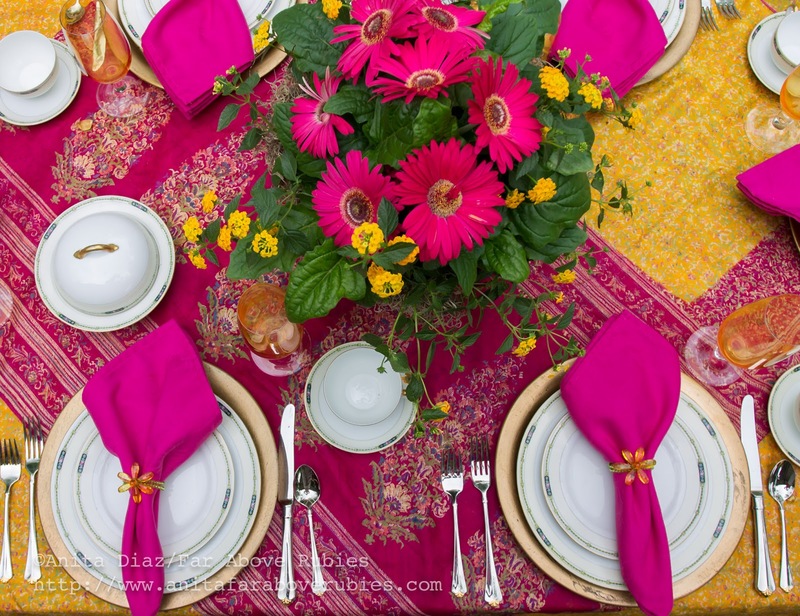 The pink sets off the elegant table with the vibrant of nature's colors. A serene place to dine. Thank you Kathleen:-) It's one of my favorite spots! 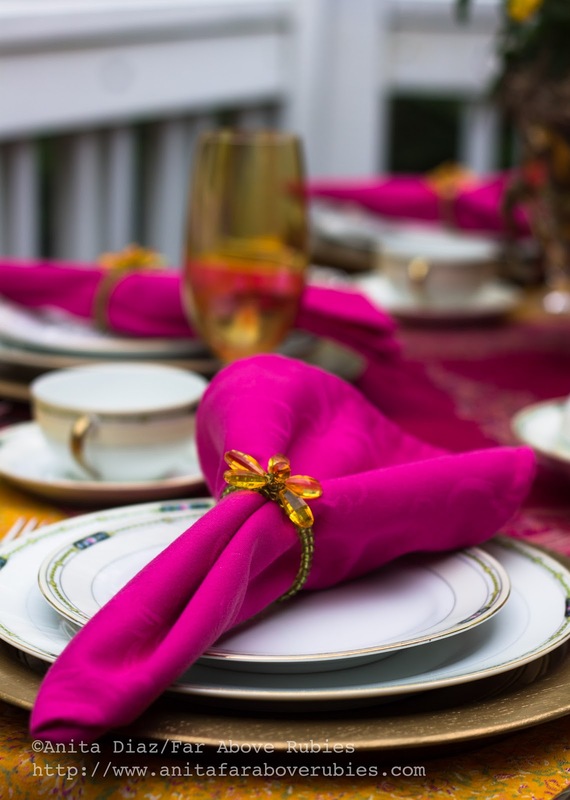 A truly exquisite table...love that you complimented the china by using the bright and beautiful color of pink/fushia...simply gorgeous and what breathtaking surroundings to dine in! The colors you picked are so beautiful and the view is amazing as well!